D3dx9_42.dll issues are caused in one way or another by an issue with Microsoft DirectX. The d3dx9_42 DLL file is one of many files contained in the DirectX software collection. Since DirectX is utilized by most Windows based games and advanced graphics programs, d3dx9_42.dll errors usually show up only when using these programs. The program can't start because d3dx9_42.dll is missing from your computer. Try reinstalling the program to fix this problem. 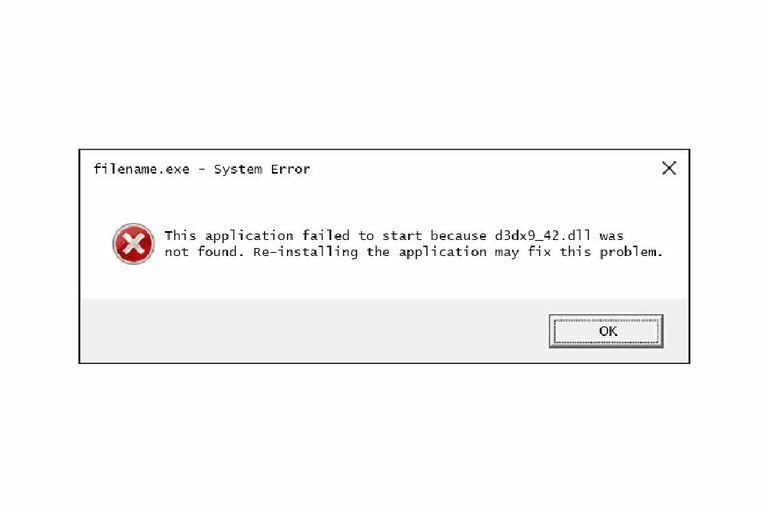 D3dx9_42.dll errors appear when a game or ​another software program is started, so it could apply to any program that utilizes Microsoft DirectX, like Autodesk's Maya or any other software program. However, d3dx9_42 DLL errors are most commonly seen when attempting to play video games. Some examples of video games that have been known to show a d3dx9_42.dll error when there's a problem with DirectX include "Sid Meier's Civilization V," "ArcheAge, State of Decay," "Batman," "The Lord of the Rings Online," "Need for Speed Hot Pursuit 2011," "The Legend of Pirates Online," "F1 2010," "Street Fighter," and "Assassin's Creed: Brotherhood." Any of Microsoft's​ operating systems since Windows 98 may be affected by d3dx9_42.dll and other DirectX issues. This includes Windows 10, Windows 8, Windows 7, Windows Vista, Windows XP, and Windows 2000. Do not download d3dx9_42.dll individually from any "DLL download site". There are a number of excellent reasons that downloading DLLs from these sites is never a good idea. If you've already downloaded the d3dx9_42 DLL file from one of those DLL download sites, remove it from wherever you put it and continue with these steps. The d3dx9_42.dll error might be a fluke and, like many computer issues, a simple restart could clear it up completely. Install the latest version of Microsoft DirectX. Chances are, upgrading to the latest version of DirectX will fix the error d3dx9_42.dll not found. Assuming the latest DirectX version from Microsoft doesn't fix the d3dx9_42.dll error you're receiving, look for a DirectX installation program on your game or application DVD or CD (it might be called dxsetup or something similar). Usually, if a game or ​another program utilizes DirectX, the software developers will include a copy of DirectX on the installation disc. Uninstall the game or software program and then reinstall it again. Something might have happened to the files in the program that work with d3dx9_42.dll, and a reinstall could do the trick. Sometimes, the standard uninstall wizard for some programs and games do not remove every single trace of the program's files from the drive and registry, which might be causing additional issues or prevent the DLL from properly being used later. Try using a free uninstaller program instead to be sure it all gets deleted. Restore the d3dx9_42.dll file from the latest DirectX software package. If the above troubleshooting steps haven't worked to solve your d3dx9_42.dll error, try extracting the d3dx9_42.dll individually from the DirectX downloadable package.